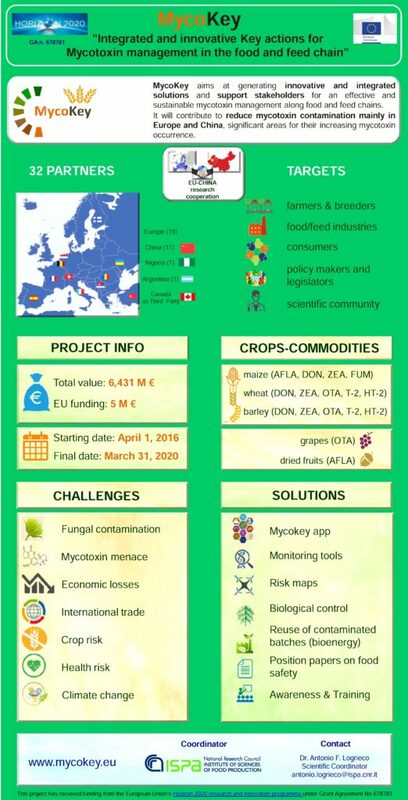 MycoKey project has been funded by European Commission under Horizon 2020 programme, Societal challenge 2 “Food security, sustainable agriculture and forestry, marine, maritime and inland water research and the bioeconomy challenge” – topic “ Biological contamination of crops and the food chain”. It aims to deliver in 2019 the first integrated ICT based solutions to address mycotoxin contamination along the food and feed chain, by using a holistic and sustainable approach. In the past, several actions have been developed to counteract mycotoxins effects and risks in the single stages of the value chains, but difficulties still remain in the application of effective methodologies by common farmers and SMEs. To overcome this problem MycoKey will integrate innovative key actions into an user friendly and cheap ICT solution, able to provide real-time information and suggestions for mycotoxin management to several stakeholders. Studies will be carried out to investigate new methods to prevent the contamination in the field, during processing and storage. New sustainable technologies will be developed (i.e. drones) to monitor toxigenic fungi, analyze and prevent the mycotoxin contamination and risk, finally to apply remediation tools. 32 partners from Europe, China, Nigeria, Argentina, including research institutions, SMEs, industries and associations will work together for 4 years, focusing on aflatoxins, deoxynivalenol, zearalenone, ochratoxin A, fumonisins. They will also operate together to strenghten the global knowledge on mycotoxins, feed an effective cooperation with China, to create interaction with other projects and initiatives, giving recommendations to regulators. The project (total value 6,4M euro) is coordinated by CNR ISPA, Italy and is started last April, 2016. MycoKey‘s concept to the mycotoxin problem is to focus on communication of current knowledge and the implementation of research results also from previous EU projects from laboratory to practice. The development of communication tool kits and simultaneously specific actions are addressed towards targeted areas, e.g. developing strains for control of AFLA in high risks areas of Europe and China, and for novel cutting edge research in fields, e.g. developing sustainable control methods. ii) Prevention, intervention and remediation. The project will deliver an interdisciplinary intervention to investigate current and emerging problems for mycotoxin management, considering all the stages along the food chains, by combining various scientific domains including agronomy, plant pathology, chemistry, molecular biology, genetics, ICT, food technology together with industrial and consumer perspectives. Partners with complementing skills and expertise will strongly interact to create and utilise synergies.